Our handled shoppers are constructed from a heavy-duty, 63-pound kraft paper stock and are made with 100% recyclable and reusable fiber with a minimum of 95% post-consumer content. Available blank or with a custom imprint on one side. Bags available in 5 sizes. Additional print options including multiple colors and hot stamping are available by special order. Please call for more information. 100% Made in America. 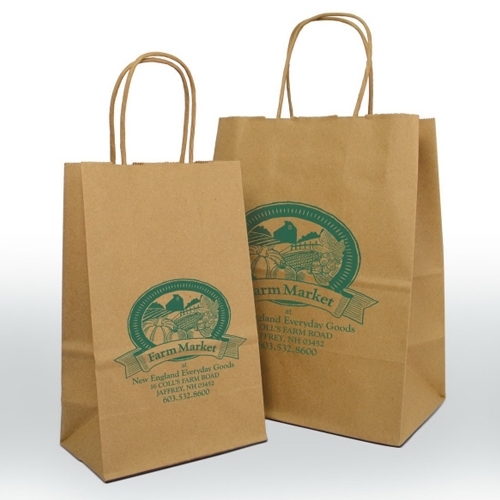 Our handled shoppers are constructed from a heavy-duty, 63-pound kraft paper stock and are made with 100% recyclable and reusable fiber with a minimum of 95% post-consumer content. Art area consists of full color label applied to bag. (Label for small bag available up to 6.5 square inches) Bags available in 5 sizes. Additional print options are available by special order. 100% MADE IN AMERICA. Our handled shoppers are constructed from a heavy-duty, 63-pound kraft paper stock and are made with 100% recyclable and reusable fiber with a minimum of 95% post-consumer content. Art area consists of full color label applied to bag. (Label for tall bag available up to 6.5 square inches) Bags available in 5 sizes. Additional print options are available by special order. 100% MADE IN AMERICA. Our handled shoppers are constructed from a heavy-duty, 63-pound kraft paper stock and are made with 100% recyclable and reusable fiber with a minimum of 95% post-consumer content. Art area consists of full color label applied to bag. (Label for medium bag available up to 8 square inches). Bags available in 5 sizes. Additional print options are available by special order. 100% MADE IN AMERICA. Our handled shoppers are constructed from a heavy-duty, 63-pound kraft paper stock and are made with 100% recyclable and reusable fiber with a minimum of 95% post-consumer content. Art area consists of full color label applied to bag. (Label for large bag available up to 12 square inches). Bags available in 5 sizes. Additional print options are available by special order. 100% MADE IN AMERICA. 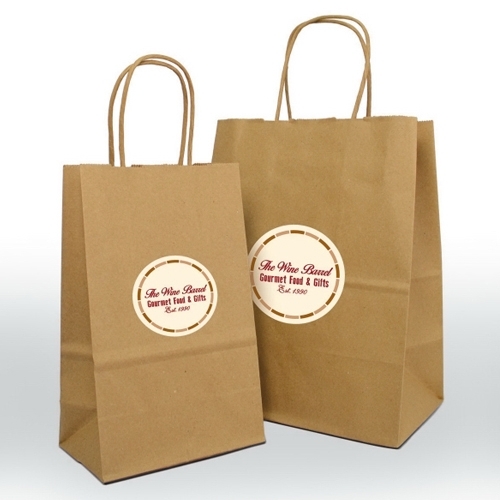 Our handled shoppers are constructed from a heavy-duty, 63-pound kraft paper stock and are made with 100% recyclable and reusable fiber with a minimum of 95% post-consumer content. Art area consists of full color label applied to bag. (Label for x-large bag available up to 16 square inches). Bags available in 5 sizes. Additional print options are available by special order. 100% MADE IN AMERICA.